We’ve already told you about some great places to visit in Normandy if you’re taking the car to France, and now we’re going to focus on neighbouring Brittany. You can reach Brittany directly from Ireland by sailing to Roscoff from either Rosslare (with Irish Ferries) or Cork (with Brittany Ferries). Another option is to sail to Cherbourg in Normandy but return from Roscoff – or vice versa – to take in the best of both regions during your trip. 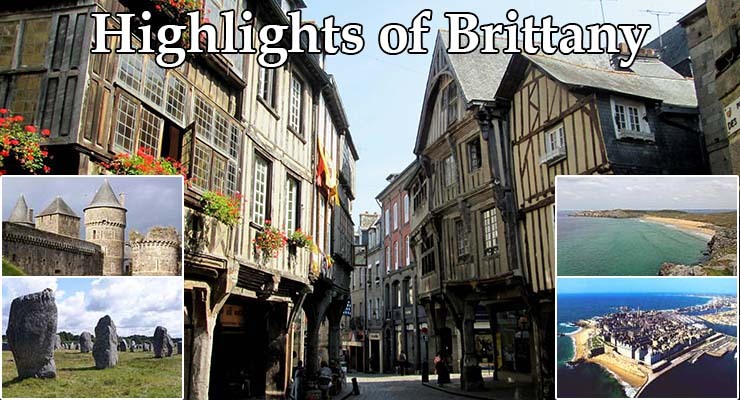 When you reach Brittany, you’ll be struck by its unique character. The region shares a Celtic heritage with Ireland, and the ancient Breton language is still spoken in some small pockets. Everywhere you go, you’ll be struck by history and natural beauty. Think Stonehenge, but multiplied by 30. There are just short of 100 ancient standing stones at the English site, but there are more than 3,000 at Carnac, some dating back over 6,000 years. One legend has it that the stones are what remains of a Roman legion of soldiers after the wizard Merlin cast a spell, but the truth of their origin remains a mystery. Note that access to the stones during May to September is by guided tour only. English language tours are available. Dinan is a fairytale medieval town, full of narrow cobbled streets and pretty half-timbered houses. It also boasts a large Gothic church where you can climb more than 150 steps up the bell tower for some fantastic views. There’s also the Château de Dinan, which is now a museum dedicated to the town’s history and to a local knight who was a leading figure in the One Hundred Years War with England (which actually lasted 116 years, from 1337 to 1453). Brittany has more than 2,800km of coastline, so beaches abound. You’ll find all types, from secluded sandy bays to more developed tourist resorts, with all the sideshows you’d expect. Some of our favourite beaches are along the Crozon Peninsula, between Douarnenez and Brest. The region also has a number of spectacular clifftop walks to enjoy. St. Malo is a beautiful walled city, rising out of granite rock on a stretch of coastline that also boasts some great beaches. The ancient streets burst with history and culture, with reminders of medieval seafarers, 18th century pirates, and the siege of World War II. You’ll find oysters on every corner for a real local delicacy, while children will love the city’s Grand Aquarium – where the attractions include sharks up to four metres long! The main attraction in the town of Fougères is its castle, Le Château de Fougères, which is the largest medieval fortress in all of Europe. The oldest sections date from the 11th century while others were added over the years that followed, and it played a central role in the history of Brittany during all that time. Younger visitors will love the tales of knights and princesses they will hear on a special children’s tour of the castle. If you and your family are taking the ferry to France this year, then we wish you all the best for a wonderful holiday. We’d like to offer you a word of advice too. Remember that many things can go wrong on a family holiday, such as an over-excited child being injured while running or playing. That’s why carrying family travel insurance is so important. Family travel insurance from Insuremyholiday.ie is the best value you will find – because when you take out insurance for mum and dad, the kids can go for free! * This applies to both our single trip travel insurance and annual multi-trip travel insurance policies. * Family Travel Insurance covers the parent or parents, and children up to the age of 18.